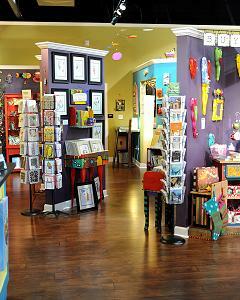 Life of the Party – Jennifer Raines and her Quirks of Art shop prove you can have your cake and eat it too! 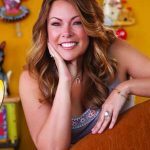 You are at:Home»Retailer of the Week»Life of the Party – Jennifer Raines and her Quirks of Art shop prove you can have your cake and eat it too! Jennifer Raines is a born party girl. If a rainbow appeared in the sky after a heavy morning of thunderstorms, Raines would instantly be on her cell phone, tweeting a message, and then posting a status update on her Facebook page to summon a crowd of friends and customers for a festive celebration. At the drop of a hat, Raines is set to enjoy her day and entertain in a big way. To that end, Raines and her colleagues became early proponents of all social media platforms. 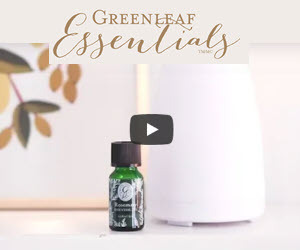 They steadfastly created a comprehensive e-mail list, built up a website and a blog, and found a home on all forms of social networking. In fact, their association with Facebook was the basis for one of their most recent bashes. After reaching 10,000 Facebook fans, Raines decided to throw herself and her followers a huge blowout. Every party needs a cake, so the hostess turned to the Web and e-mailed a commission to Alice Cooke, the owner of Cakealicious. Raines told the local bakery proprietor, “Let your imagination go wild. I want to see what you can do!” Cooke lived up to the challenge and chose the image of a whimsical wooden heart and two wall tiles from the Quirks of Art shop as her cake motif. “I squealed with excitement as Alice pulled it out of the case. The cake was stunning, and it tasted as good as it looked!” she recalls. After posting the photo of the cake on her Facebook page and trumpeting the achievement, customers flocked in to share their well wishes and nibble on the baked goods. A cheery optimist, Raines has known her share of disappointment, but she hasn’t permitted it to keep her down. Over the past 10 years, she has spearheaded other variations on Quirks of Art, which didn’t thrive as well. “It started as Kinks, Quirks & Caffeine, which was a handcraft gallery that featured a coffee bar inside. 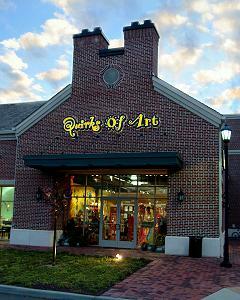 Then I added on Kinks & Quirks Contemporary Handcrafts in Yorktown, Virginia. When the economy turned, I closed down both of those locations. I morphed them into my gallery today, Quirks of Art,” she reveals. When Raines’s beloved mother passed away unexpectedly in 2002, it was a wake-up call for the then-27-year-old. She reevaluated her career path, made drastic changes, and began her adventure in retail. It’s a direction she has never regretted, and a choice she continues to celebrate to this day. Do you have a personal philosophy or mantra? What would a person be surprised to learn about you? I’m a certified sailor and I’ve completed four marathons. I’ve just started electric and acoustic guitar lessons. As a purveyor of quirky artistic creations, what do you create in your spare time? This would be a big surprise to some of my customers, too, but I don’t have an artistic bone in my body. I can’t even draw stick people! One of my next goals is to take art classes and then begin an artistic hobby. What is the take-away lesson you’d want a shopper to gain from your store? When people buy from my store, they are also supporting the artists I represent. My business structure has a very positive “trickle-down” effect. 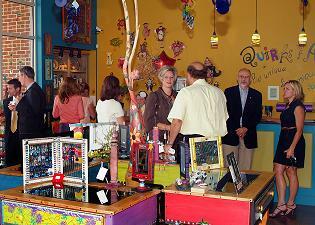 The money spent here stays with small, independent business owners and artists. It stays in the USA. Do customers have a favorite shop employee? Of course! It’s Zack, my nine-year-old Maltese. He is the store’s official greeter. 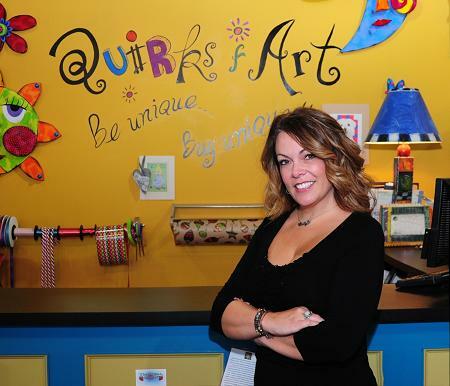 Jennifer is a native Virginian who has owned five retail stores, opening her first at age 19. 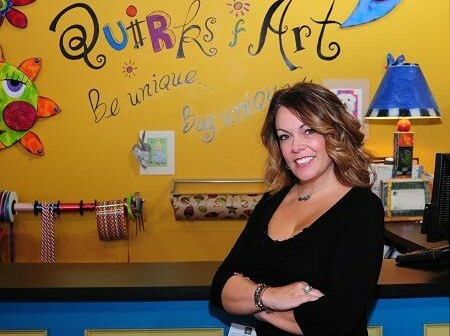 She has operated some form of her current business since 2005 and currently has a flagship store in Williamsburg, Va., called Quirks of Art, a website (www.kinksandquirks.com), and a strong social media presence. Raines has won numerous honors, including “Top 40 Under 40,” Niche magazine’s “Top Retailer,” and a Women in Business Achievement Award.